The year starts in Great Britain traditionally with the first hour bell of Big Ben in London. It is shown on all channels at midnight, so you can't miss it. Since the turn of the Millenium, which has also in GB been wrongly celebrated on Jan 1st 2000 (the new Millenium started of course on Jan 1st 2001), the new year is also greeted with fireworks, something that was done in Germany for ages. Before 2000 this was rather unusual in Britain. Another tradition is the singing of "Auld Long Syne" after midnight, a song that probably everybody knows in Germany, but not necessarily knows the title (the tune is found preinstalled on some mobile phones). The lyrics origin from the Scottish national poet Robert Burns, who is also honoured in January at "Burn's Night". The song is remembering friends from a long time ago. A very vague correspondence is found with the song "verdamp lang her" ("damn long ago") by the Cologne band BAP . Talking about Scotland: the wildest new year parties are found in the north of the Island. The biggest party is held in Edinburgh and is called Hogmanay, no matter what the weather is there is quite some boozing on the streets. If you want to know how popular Edinburgh is on New Year's Eve, just try to book a hotel room for that night. Another hint is the fact that the Scots have two holidays in a row at the start of the year, knowing well that you can't make much use of the work force yet on Jan 2nd. We stay in Scotland: the 25th of January marks the birthday of Robert Burns (1759 - 1796), the national poet of the Scots. The Scots love him since he used Scottish language in his poems, what makes them difficult to read for a non-Brit - even the English got some problems with that. Robert Burn's birthday is some kind of a holiday in Scotland. This day is celebrated with banquets, where his poems are read, and the Scottish national dish Haggis, Neeps and Tatties is served. The Haggis is then cut open during the recital of his "Adress to a Haggis". Oc course the whole "Burn's Supper" is accompanied by lots of Whisky. Bigger events also feature bagpipes, and of course it is a must to wear a kilt. The haggis is a stuffed sheep's stomach, where offal and oats are used. This sounds a bit like the Pfalz Saumagen ("porc stomach"), but in reality the haggis looks more like a coarse Leberwurst (liver sausage), and the taste is also more towards that one. Instead of sheep's stomach there also plastic tubing is used (as in the picture), which makes the haggis last longer. 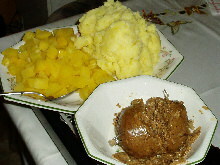 Neeps are turnips, which are either diced or mashed, and Tatties are simply mashed potatos. This is of course not appealing to everybody, but tastes a lot better than it sounds! Carneval, like it is celebrated in Germany, does not exist on the Island, only the carnival tuesday is known as "Shrove Tuesday" or "Pancake Day". Like the name suggests, the tradfition is that pancakes are served on this day. These are done the same way as the ones in Germany, but they are usually sprinkled with sugar and freshly squeezed orange or lemon juice. Shrove Tuesday once was an opportunity to have a good meal before lent starts, but these days this isn't the attraction anymore. Despite that it is still rather popular to meet up and have pancakes together, since this has quite some tradition. On pancake day there are also sports events like pancake races where you have to turn them in the pan during running. A rather normal sport seems to be the Shrove Tuesday Football, but this is in fact a cross-country game through rivers and mudfields and no particular rules. On March 1st the Welsh celebrate their national holiday St. David's Day, since St. David is the patron saint of Wales. It is not an official holiday neither in Britain nor in Wales, although lots of Welsh people would love it to be that way. St. David lived in the 6th century and founded a monasterial community on the southwestern tip, where the city of St, David is found today, and which forms the religious centre of Wales for more than a millenium now. Also, St. David is the only one of the four patron saints which has been born in the relevant country. A daffodil or a leek is worn on this day, both being Welsh national symbols. At the beginning of March the National Exhibition Centre (NEC) hosts the biggest and most famous dog show in the world - Cruft's. In Germany this is generally associated with well-groomed poodles, but in reality all kinds of dogs are represented. In the first round the best of each breed is chosen, in the second round the best of breed compete for the best in group, in the last round the best of group winners do the big final for the best in show, which is the overall winner of the year. Of course you can't just bring your dog into the competition - it has to win some minor events before it is allowed into Cruft's. But if one of the highly desired prices is won, it has also financial advantages for the owner, since it's offspring is increasing quite a bit in value. This event shows very well the British love for animals, since the quadrupeds in this show get a treatment that would make every celebrity envious. A rather different aspect is the Grand National horse race in Aintree near Liverpool, where the horses have to race over 30 5-foot-(1,5 m)-barriers. It happens frequently that the horses break their bones and have to be put down, which makes the Grand National a target for animal protector groups. Mother's day ist mostly in March, precisely on the fourth Sunday in lent. This has a century-long tradition, in contrast to the German one which was taken over from the USA at the beginning of the 20th century and is held at the second Sunday in May. The 17th of March is celebrated in British pubs as it is in the rest of the world; after all this one of the biggest export hits of the "green island".